-Cleat installed in bow -1 Minn Kota Riptide 55lb thrust trolling motor with cutoff switch to prevent electrolisis -1 90qt cooler installed on bow -1 Custom Aluminum cooler mount with 4 extra rod holders by Custom Marine Concepts -1 Custom Aluminum Seat Mount by Custom Marine Concepts -1 Reversible Seat Back with 4 extra rod holders built in (great for facing the stern while catching YellowTail) by Custom Marine Concepts -1 Gaff Holder -1 Removable 4 Step ladder. Able to swim up to the 1st step with ease -3 Batteries (2 for engine and electronics. 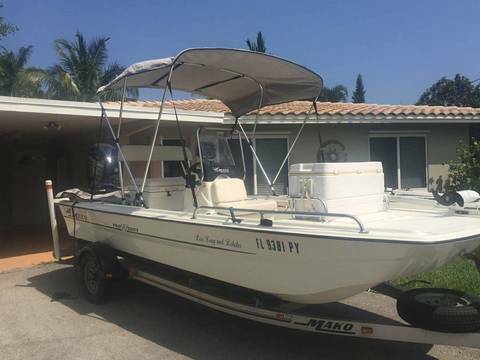 1 for trolling motor) in boxes -2 Removable 6.6 gallon fuel tanks -Anchor with 300' of line -Lowrance 7" HDS7 Fishfinder/GPS with spots loaded for Miami/Broward/Keys/Port Charlotte areas -Bimini Top -2 Rod holders mounted in stern area for trolling -Stainless Steel Vengeance 13p prop -1 Spare aluminum prop -2 9' stake out poles -60hp Mercury 4 stroke with approx 80 hrs. Always flushed after every use. Recent engine oil and Lower Unit oil change. Starts and runs great with extended warranty left. Boat is always under cover and in car port. Never left outside and power washed after every use. Won't find another Skiff with these extras and low hours at this price.